Bridget Mackerrie is aged twelve living on a Scottish island of the 1860s. She is the second youngest of four children, her siblings being Ishbel, Effie and Lachlan. She has a withered arm and a deformed foot. But Bridget does not allow these impairments to hold her back. 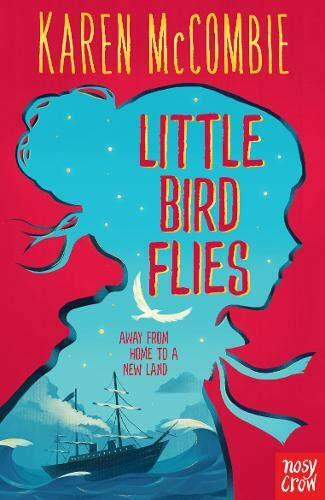 She is desperate to leave the island that is her birthplace – hence her nickname Little Bird. She wants to fly away. The question is whether she can contrive this escape? As the book opens, the Laird of the island is a kind and just man, who treats his tenants (everyone on the island) fairly and well. But when he dies, his successor and his family treat the tenants like the scum of the earth. The new Laird believes (falsely) that Bridget’s family is involved in some troublesome dealings. The father decides that they must make a secret getaway. McCombie is clearly a historical perfectionist. She depicts the atmosphere in the most convincing way. Bridget’s character also strikes the reader as sympathetic. Most readers will back her efforts all the way. However for any reader with a disability, sometimes the impairments of the protagonist seem either to have inexplicably become less severe or alternatively have simply escaped the author’s attention. We see Bridget on many occasions climbing mountains and gates without the slightest impediment. On most occasions Bridget’s impairments are properly dealt with. But this only makes it more obvious when on other occasions they vanish into the Scotch mist. This major narrative flaw diminishes the quality of an otherwise excellent book.